Tone your tush with this quick and effective circuit booty workout with five simple exercises. All you need is a dumbbell and a mat. As someone who sits a ton for work (unless I’m feeling motivated and using my standing desk), I’ve come to realize that doing glute work is super important. A few years ago I was going to physical therapy for tingling in my left quad and was told by the therapist that my glutes were “asleep” and not firing properly, which often happens if you sit a ton. This was causing my hip flexors to shorten and become crazy tight, in turn causing nerve impingement, which was the source of the tingling. Everything in our body is connected, and when one thing is weak or out of whack it creates such a domino effect. So sure, a firm and lifted booty is #goals but having strong glutes that are actually “turned on” and firing is the real goal here. Strong glutes help prevent tight hip flexors and help stabilize the pelvis, which means you’re less likely to put unnecessary pressure on your lower back, knees and ankles. Glute strength also helps with other athletic skills such as agility, speed and jumping. Now that you know the why behind building your glute muscles, let’s get right into this quick and effective workout. Basically I’ve put together a circuit with five of my favorite booty exercises. You’ll do each move for 30 seconds (some will require 1 minute because you’ll be doing 30 seconds on each side) and complete three full rounds for the full workout — this should take you about 12-15 minutes. The only equipment needed is a dumbbell, but it might be nice to have an exercise/yoga mat depending on where you’re doing the workout. See below for detailed instructions for how to do each move. 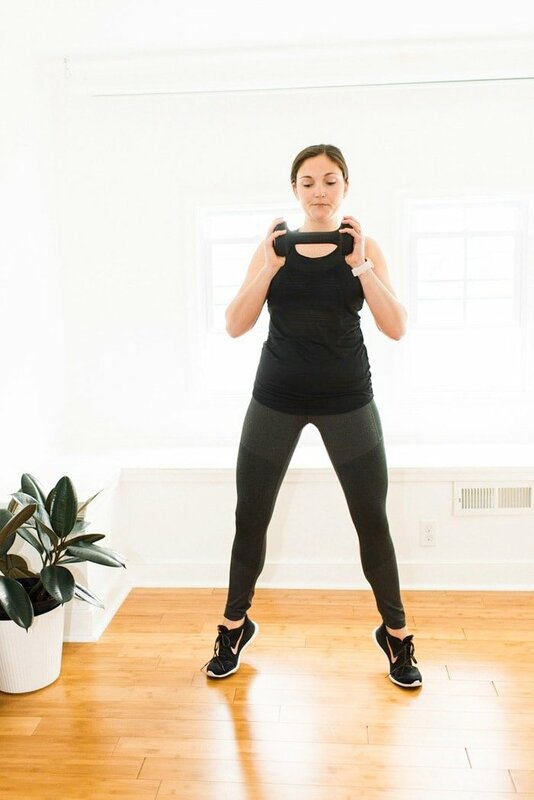 Sumo Squats with Heels Raised — choose a medium dumbbell and squat for 30 seconds. Single Leg Deadlift — choose a medium dumbbell. Do one side for 30 seconds and then switch to the other side for 30 additional seconds. Dumbbell/Kettlebell Swings — choose a medium dumbbell and do 30 seconds, alternating arms. Clamshells — do 30 seconds each leg. Single Leg Glute Bridges — do 30 seconds each leg. Holding a dumbbell with both hands, place feet wider than shoulder-width apart, toes pointed out. Lift both heels off the ground. Squat down slowly while maintaining proper form, pause, then raise back up. Grab a dumbbell in your right hand and stand on your left foot with your knee slightly bent. Lift your right foot off the floor and bend your knee slightly. 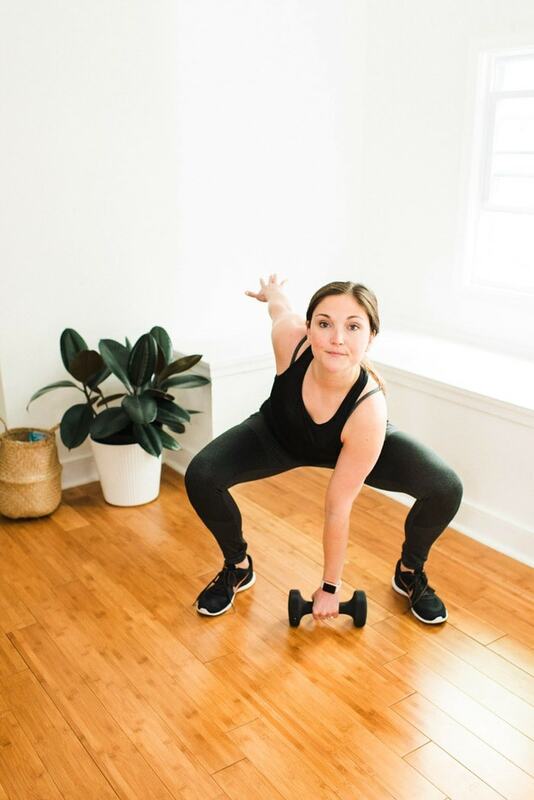 Bend at your hips and lower your torso, keeping a straight line from your head to your lifted foot, as you rotate slightly to the left and touch the dumbbell to your left foot. Pause, then raise your torso back to the starting position. Repeat for 30 seconds, then switch and do the same thing on the other side. Grab a dumbbell (or a kettlebell) and hold it in one hand. Set your feet shoulder-width apart. Without rounding your lower back, bend your knees slightly, push your hips back, and swing the weight between your legs. Once the weight is behind you, forcefully contract your glutes and thrust your hips forward to swing the dumbbell to chest level. You aren’t using your arms or shoulders to raise the weight; the momentum of your hip thrust should swing the dumbbell upward. At the top of the movement, contract your core, glutes and quads as hard as you can — imagine your body is in a vertical plank position. Then allow the weight to swing back between your legs, switch the dumbbell to your other hand and repeat. Lie on your side with your hips and knees bent at a 45° angle, your legs on top of one another and your heels together. Keeping your feet touching, raise your top knee as high as you can without moving your pelvis. Pause, then return to the starting position. Repeat for 30 seconds, then flip over and do the same thing on the other side. Lie on your back with your left knee bent and your right leg straight. Raise your right leg until it’s in line with your left thigh. Push your hips upward, keeping your right leg elevated. Pause, then slowly lower your body and leg back to the starting position. Repeat for 30 seconds, then switch legs and do the same thing on the other side. I hope you enjoy this quick and easy booty workout. 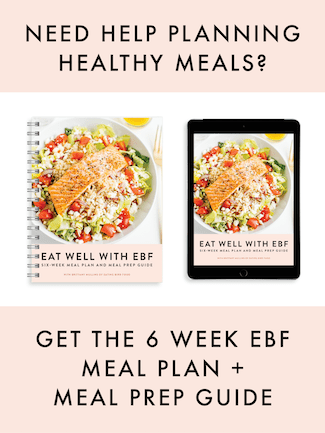 If you try it, you’ll have to let me know your thoughts in the comment section! Photography by Michelle Chu Photography.